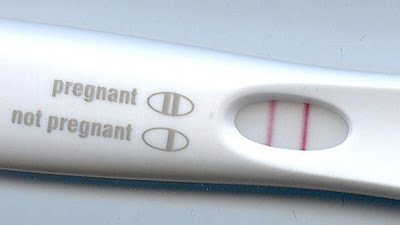 A positive pregnancy test. Source. There’s an old saying: You can’t be a little bit pregnant. Pregnancy is what you might call a binary condition -- you either are with child, or you're not. Home pregnancy tests embody this thinking. You pee on the end of a stick, and three minutes later you either do or do not see a line in the results window. If the former, then: Congratulations, you’re expecting! Biologically, of course, things are a bit more complicated. Pregnancy tests check for the presence of a particular protein, human chorionicgonadotropin (hCG), that is also elevated in women with breast and ovarian cancers. As a result, it’s sometimes useful to be able to quantify the levels of hCG -- or any other so-called “biomarker” -- with a bit more precision. A new diagnostic device, developed by a team of Texas researchers and described last month in the journal Nature Communications, can make that happen. The team designed what’s called a microfluidic device, a circuit of tiny channels etched into glass (or sometimes plastic or a rubber compound) that enable researchers to run chemical assays on tiny volumes of sample. That’s helpful when the sample is particularly precious or hard to come by -- a drop of blood from a newborn baby, say. Microfluidic devices, sometimes called “lab-on-a-chip” devices (because they resemble computer chips in both design and size), are popular in both drug development and research laboratories, as well as in the clinic. Their reduced volumes and size mean they use less of the materials required (making them relatively inexpensive) and produce less waste. They are also faster and higher throughput (processing a lot of samples at once) than many traditional experiments, and easily automated. To circumvent these problems, the Texas team used a clever “SlipChip” design. A SlipChip is a microfluidic device formed by overlaying two glass plates with channels that can form one of two flow paths depending on the position of the top plate relative to the bottom. In one configuration, the channels flow left-to-right; in the other (that is, after sliding or “slipping” the top plate), they flow bottom-to-top. Samples and reagents are loaded in one configuration, and the chip is “slipped” to start the readout process. Source: Nat. Commun. 3:1283 doi: 10.1038/ncomms2292 (2012). In the SlipChip, two pieces of glass etched with microfluidic wells and channels are assembled together in the presence of mineral oil. A fluidic path is formed when the two plates aligned in a specific configuration. Samples or reagents are preloaded through drilled holes using a pipette, and the top plate is then moved relative to the bottom plate to enable the diffusion and reaction of samples or reagents. The team calls its device a “volumetric bar-chart chip,” or V-Chip. The V-Chip runs what’s called an ELISA (enzyme linked immunosorbent assay), which, the authors note, "serves as the clinical gold standard" (the best practice) in biomarker quantitation. Normally ELISAs are read with an instrument that can measure either color changes, fluorescence, or chemiluminescence. The V-Chip is far simpler (albeit, less quantitative). It uses an enzyme called catalase to degrade hydrogen peroxide into oxygen gas in volumes proportional to the molecule of interest -- in this case, hCG. That gas, in turn, forces a column of red dye upwards to a height determined by the hCG concentration. The result is an easy-to-read microfluidic bar graph, with the height of each bar indicating not only if a woman is pregnant, but also how much hCG is in her urine. In a comparison against a commercial home pregnancy test, the V-Chip was more sensitive at low hCG concentrations, and more quantitative at very high concentrations. The V-Chip’s design is flexible, the authors note and can be jiggered to test either a large number of samples for a single molecule (as might be done in a clinical trial) or a single sample for multiple molecules, as in cancer screening. The current design allows as many as 50 parallel fluidic channels, meaning up to 50 molecules could be tested in parallel. In one experiment, the team used a six-channel design to test a panel of breast cancer cell lines for the abundance of three proteins (estrogen receptor, progesterone receptor, and human epidermal growth factor receptor) commonly found on breast cancer cells. The simplicity of the test means it should be possible to design a device that can be used at home or in a doctor’s office. It is cheap and fast and requires no special hardware. That means it could be used in areas lacking access to top-shelf medical care. It could even be used in the absence of a physician altogether. "The bar chart could be captured as an image using a smart phone, similar to a barcode reader and transmitted to a cloud computer for instant medical suggestions in the future," the authors write. Now, how cool would that be? (*) That's not entirely true. Harvard researcher George Whitesides has figured out a way to print microfluidic circuits onto paper, resulting in very simple and inexpensive diagnostic assays. In September 2012, Whitesides and colleagues described one such test for drug-induced liver damage, which is being commercialized by Boston-based Diagnostics For All for use in third world countries.